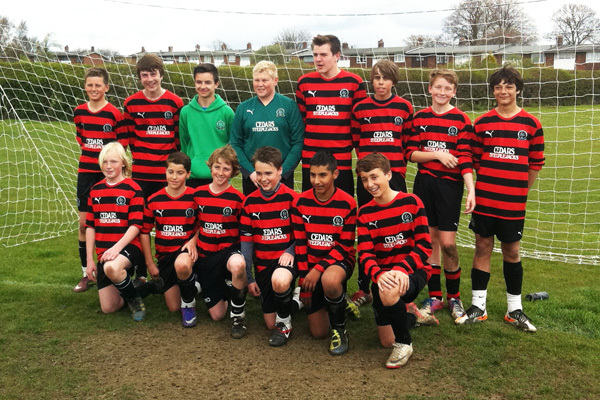 We played Gorleston Rangers Hawks under 14 needing a win to secure our fifth consecutive NSYL division 1 title. Our last league defeat was in September 2009, which is a remarkable achievement in a competitive division which contains many good sides. The Hawks came out very fast with the wind at their backs and pegged us back in the opening 15 minutes. Gradually we got a foothold in the game and began to pass the ball around. Once again we held good defensive shape with Bradley prominent. We took the lead from a free kick when Adam nodded in from close range. Max made a great save when a low shot came through a mass of players. This save was the catalyst for an improvement in our performance. HT 4-0. Second half we passed the ball around much more quicker and had better movement off the ball. Our fifth goal from George was the goal of the game after a half a dozen one touch passes, saw him slot the ball clinically past the Hawks keeper. FT 10-0. Goalscorers: George (4), Jack (3), Mikey (2) and Adam. MOM: The team. Last game of the season is against Gorleston Rangers Hawks. KO: 10-30am Venue: Magdalen Playing Field Meet at the ground at 10am. Call offs ring Chris or Des. Thanks to our sponsors JAG Carpentry Limited, Cedars Steeplejacks and Glenfield for their support.